The way your roof is fastened to your house is probably the last thing on your mind most days. However, when the Coburg Cow comes down, and local meteorologists start rolling up their sleeves, it’s hard to stop wondering about the finer points of how your house is constructed. By then, it’s too late to start learning about how hurricane-resistant your home is. Long-time residents will remember the time we all learned a lot more than we ever wanted to know about hurricanes and building codes: In 1989 Hurricane Hugo made landfall on Isle of Palms as a Category 4 storm. Hugo came roaring in with 140 mph winds and a 21-foot storm surge. Isle of Palms was submerged entirely, there were waves in the living rooms of elevated houses, and hundreds of homes were completely destroyed by wind. Hugo caused $9.47 billion in damage. Building codes were changed. 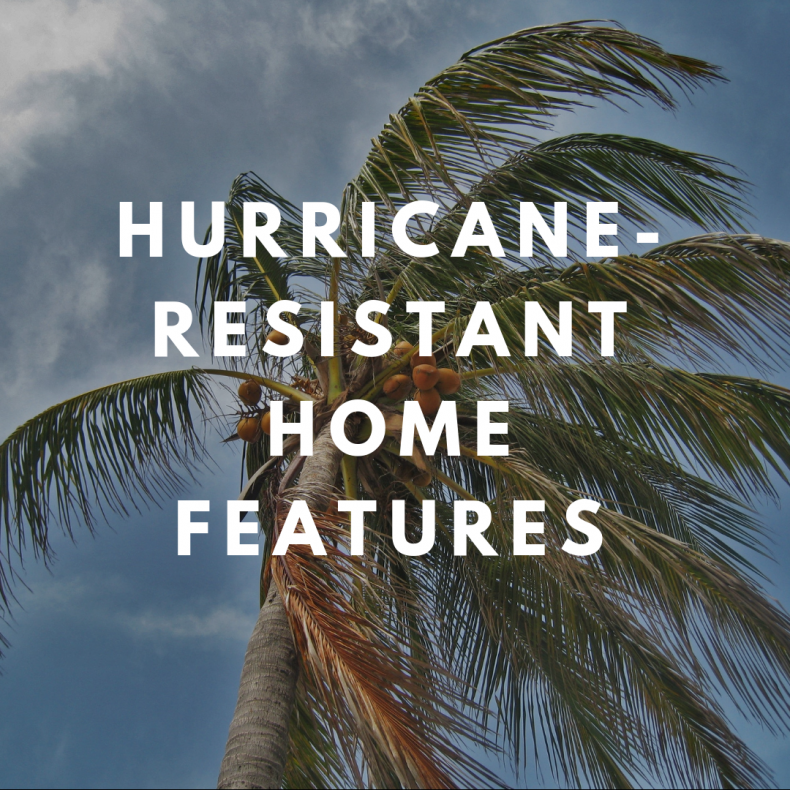 While there is no such thing as a hurricane-proof home, new building codes are meant to mitigate damage from wind, rain, and flooding, making homes hurricane-resistant. Besides these building codes, there are also best practices that can help a home stand up to hurricanes. These features can give you more protection in a storm, and lower your insurance premiums. Hugo paved the way for an onslaught of new construction. The first thing you need to learn about any house you’re interested in buying is the year it was built or restored. Newer construction is better as long as the home was built to code. Some weren’t, kicking off a landslide of lawsuits against builders, so it pays to dig into the history of the house. What Kind of Roof Does it Have? A hip roof that has four slopes will stand up to extreme wind better than a gable roof with two slopes. The roof overhang should be less than 20”, giving wind uplifts less to grab. What Shape is the House? When it comes to shape, simple is better. Aside from a round house such as the iconic home on Breach Inlet, square homes (or hexagonal or octagonal) handle high winds the best. How is the Roof Connected? You may have to ask your home inspector this question, but it’s important. Roofs should be attached securely to the walls (not stapled), and the home should be securely connected to the foundation. Ideally, the house is connected continuously from roof to foundation with metal straps. Is it Elevated? Is it Open? Elevated homes on open foundations allow floodwater to pass underneath without putting undue stress on the structure. With real estate at a premium in Charleston, it can be tempting to close in all that open space below the house for better storage, hobby space, or even living space. If you’re interested in an elevated house, the area beneath the home should be open. (Widely spaced siding or privacy boards are okay) Solid walls or structures that impede the flow of water will likely void your insurance. High winds can turn debris into deadly projectiles. Ideally, windows and patio doors should be impact-resistant. These windows are made of two sheets of glass with a polymer interlay between them. If the glass is shattered, the polymer holds the glass together. These types of windows can typically withstand a 2×4 board flying at 50 feet per second, or about 34 mph. If you have impact-resistant windows, you don’t need storm shutters. However, if impact-resistant windows are cost prohibitive, the next best option is storm shutters. Many Charleston homes have shutters as part of their aesthetic. When you’re inspecting a house, make sure the shutters are functional and not just pretty. Other building codes cover everything from how many nails should be used to how studs should line up from floor to floor. If you want to dig into the codes for wood construction, you can download the American Wood Council’s publications. Of course, once the home is built, you won’t have visibility into some of these elements. If you’re building a new home, ask your homebuilder to explain how they adhere to code, and then check it out as your home progresses. Charleston has dodged the worst of the storms in the last several years, and hopefully our luck holds for many years to come. However, it’s always best to be prepared. As you’re looking for a home, keep in mind that the odds are you’ll be preparing it for a hurricane some day. Do your hurricane homework now and you’ll have more peace of mind (and lower insurance premiums) later.